The first poster for Venom has been revealed. The Comic Con Experience in Brazil is currently happening and, though not as well known as San Diego Comic-Con, there's still a lot going on and studios are trying to promote their upcoming releases. Sony is currently filming the Venom movie and used CCXP as the place to unveil the first poster, and possibly movie logo, for the Spider-Man spin-off. Fans of the comic book version of Venom, who first appeared in the world of Marvel Comics in 1984, will likely be pretty pleased with this first poster. It features a blood red V, with the titular character's snarling face, sporting his signature, razor-sharp teeth. The larger banner also reveals the tagline, "We are Venom." That likely refers to the fact that Venom is the product of an alien symbiote and the host, who has taken on different identities over the years in the comics. It was recently teased by Tom Hardy's trainer for Venom that, "The world is going to see is one of the darkest, most powerful supervillains that Marvel has ever created. It's going to be carnage." 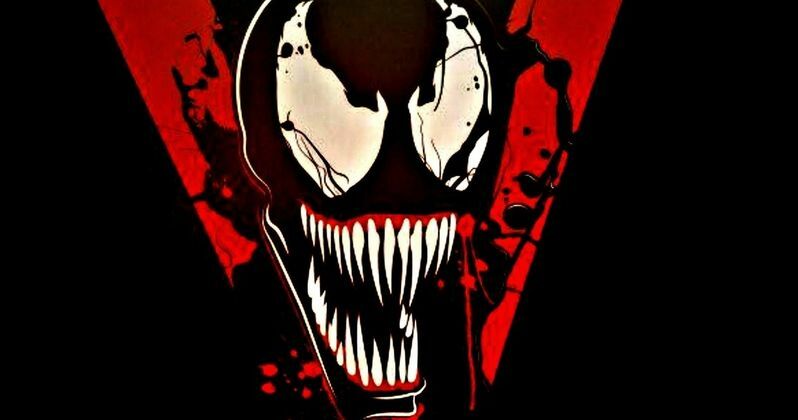 While that could just mean the movie is going to be violent, it also could be hinting at Carnage, aka Cletus Kasady, who is expected to be the villain of the movie. Riz Ahmed (Rogue One: A Star Wars Story) is rumored to be playing the fan-favorite villain. The movie, which will not feature Tom Holland's Spider-Man, or any version of the character, and doesn't take place in the Marvel Cinematic Universe, also stars Michelle Williams (Manchester by the Sea) and Jenny Slate (The Secret Life of Pets). Ruben Fleischer (Zombieland) is directing Venom, which is set to arrive in theaters on October 5, 2018. It's also expected that the movie will follow in the footsteps of movies like Deadpool and Logan and carry an R-rating. Topher Grace previously played Venom in the much-maligned (Spider-Man 3). We can assume that this will be at least a little better than that, but the bar is set pretty low. Be sure to check out the new Venom movie poster, first spotted by Collider, for yourself below.